Political poster campaigns usually leave us all cold. Very occasionally one hits the spot. Remember "Labour isn't working"? Now UKIP has produced four together. As with the old Tory poster, when the message resonates with public understanding and experience, coupled with a large dose of truthful reality, it is powerful. So the MSM outpourings of racist accusations and the PBBC's use of the word "perception" demonstrate the sense of panic in their masters' lairs and secret dens! As Raedwald points out the MSM, on the whole, do not use the fourth poster, comparing our lives with those of the Politburo fat cats. Remember, this phrase fits the political elites as much as the bureaucrats. We also have to realise that UKIP, rightly or wrongly, for now, offers us a possible last chance to bring down the modern dictators funded by banks, corporations and their gangster friends. 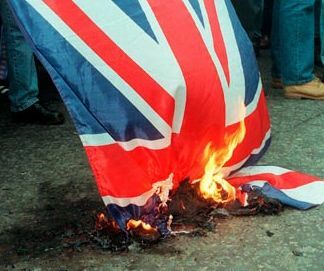 A massive and united installation of right wing representatives, in May's EU elections, would cause blatant panic throughout the establishment smug ruling classes. A probable falling out among these cartels, as people turn elsewhere in search of change, might well ensue. A sort of Manchester United scenario with several factions so at odds the games themselves imploded. Hard not to like and relish. However it remains a massive ask to hope, let alone witness, the collapse of the present order. It is, afterall, a mammoth organisation, with secretive power possibly never ever known in human affairs, until now. So we "little folk" will need a highly charged sense of oppression to find the will to take them on. I congratulate those behind the UKIP posters for offering a lifeboat to board. If nothing else, tweaking the beast's tail hard enough to hurt is no bad thing! If the MSM's howl is a pointer to this fun working, keep it up!